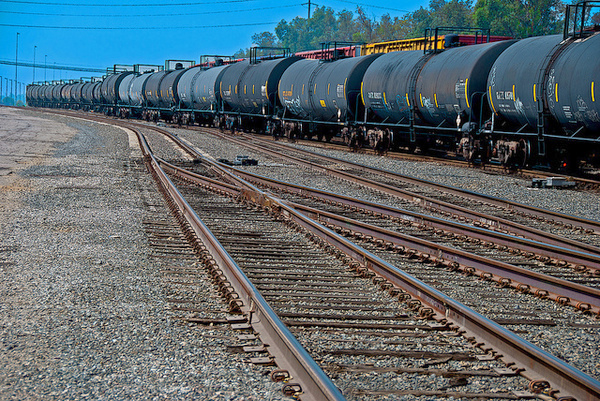 Governor Cuomo's office said the latest round of rail safety inspections revealed "critical safety defects" on sections of track in New York State used by crude oil tanker trains. Many of those problems came on a stretch of track running between Washington and Saratoga Counties. Since a crude oil train detonated in a small town in Quebec in 2013, state officials and the Federal Railroad Administration stepped up inspections of rail tanker cars and the tracks in New York. The latest round of scrutiny came last week and uncovered 93 minor defects and seven critical safety defects. The New York State Department of Transportation said that means they have to be fixed right away. As part of that process, a Federal track inspector examined thirty five miles of track and switches between Fort Edward in Washington County and Burnt Hills in Saratoga County. According to a statement issued yesterday, the inspector found three critical defects — described as missing bolts in rail joints — which were immediately repaired by a Canadian Pacific crew. According to the report, eleven non-critical defects were also found on that stretch of track, including loose and missing switch bolts, and fouled ballast. In a statement, Governor Cuomo blasted Federal officials again for what he called "the current lack of tough regulations" on oil train shipments. "This latest round of inspections shows that our efforts are making a significant difference when it comes to protecting New Yorkers," Cuomo said.